Even worse – they are quite the common plant on Irish graves! I saw TONS in July when we were touristing about. Ah! I thought the worst was that the picture was taken by iDJ… According to what you said, the actual colors are probably a lot better. Any reason why you don’t take a picture now? Is it standing on a heater or a baby gate or something? It’s nice you got a way to smile while getting into the bathroom. Other than iDJ being there just out of the shower. I need to find something that will make me smile in my bathroom. There is nothing in there to make me smile, and there is nothing I do in a bathroom that makes me smile. Ugh, my bathroom isn’t the cleanest, or uncluttered, and it only gets sunshine a few hours a day this time of year! 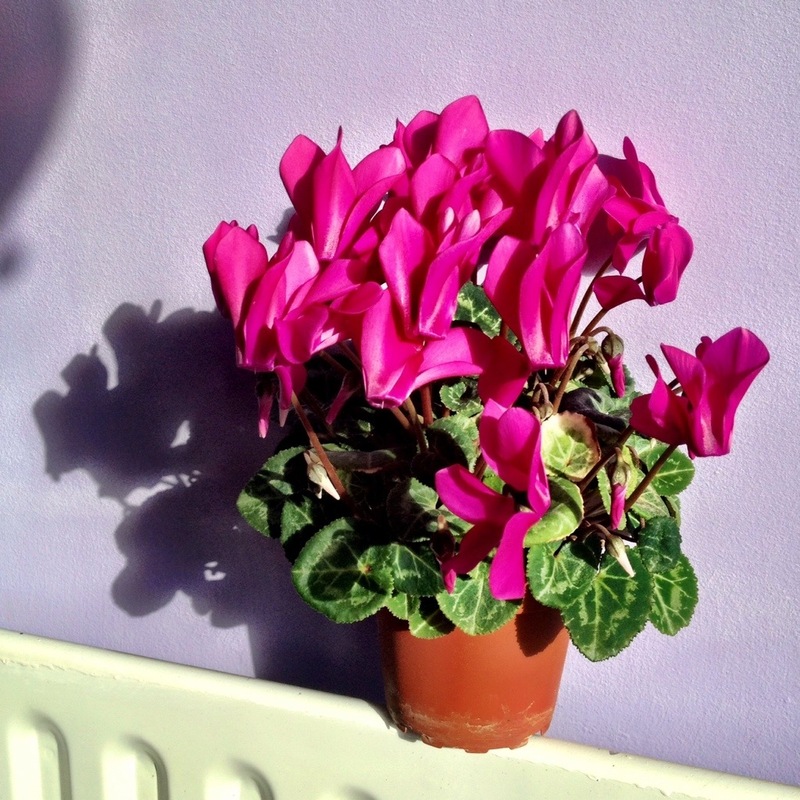 Yes, I brought it downstairs and set it on the radiator in the sunshine for special effect – but to be honest you are right – it looks best in the place it grows best! Yeah I usually only ‘smile’ in the toilet when I want to make sure I don’t have food in my teeth! Oh, it sounds like yours is better than mine! I don’t have any natural light in there (no window). It’s small and definitely cluttered. I need to install a shelve or two, but I haven’t got to do that yet. As for cleanliness, it depends what day of the month it is. I usually only get the motivation to clean it when I toilet talks to me lol. When I moved in, the walls were mauve. I painted them in white, except for the walls around the tub, which I left mauve. Initially because I was lazy and thought I would figure what color to paint these later, but I think I like it like that after all. and upstairs there is a lavender crystal in the window so the shower (whose curtain is hung with rhinestone hooks from a big box store sale table) gets all rainbow-y in the afternoons. Life is short and everyone must go to the bathroom! Sport joyfully with your loo! Argh, why did that require approval? Too many links perhaps. I think I have a setting for that! I’m about to head out to the pub! My potty is barely large enough to turn round in, and is full of plants and HIS hair products! *Must* go to the bathroom… Not where I’d spend a lot of time though. Still, I cannot disagree, it would make the requirement more pleasant if the room was more inviting. Love them! they always go toes up on me though…..